Karjat is an interesting weekend proposition for anyone who wants to have a break from the hectic city life. But affordable accommodation seems to be a problem, but thanks to Pinewood Resort you can enjoy your stay in Karjat without burning a hole in your pocket! For approximately Rs 350 you can spend a day at Pinewood Resort and this includes your meals as well, vegetarian and non vegetarian. Pinewood is situated in Varai village that is 5 km away from Karjat Station and 65 km away from Mumbai. The resort is situated on three acres of lush green land and offers interesting features like a visit to a pottery factory, Kondana caves, Dams and Waterfalls. They cater to Schools for one day and overnight picnics along with camp fires and dancing. They even organize a treasure hunt, games and environmental programs. For entertainment purposes there are carom boards, a volley ball court, a ground for cricket or football as well as Badminton while the children have their special parks with slides and swings. To cater to corporate there are two training halls, outdoor training programs, pool side parties and a jogging walking track. Pinewood Resort, presently has 7 Deluxe spacious Rooms. 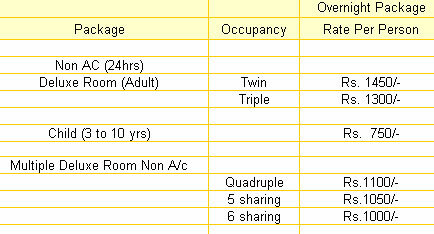 The capacity of each rooms is a maximum of 6 guests. The beautifully designed rooms are with a kingsize bed and an attached wash room. On the Mahavir Peth road leading to Karjat station, close to the rickshaw stand is a beautifully made Jain temple. Catering to a small Jain community present in the area the temple is the only Jain Mandir in Karjat. Like most of the Jain shrines, this one too is carved out of white marble. The entrance bears intricate carvings of figures symbolising Jain faith. When Bollywood shifted to Karjat, this scenic village was on the map of not just directors but also tourists. ND Studio has become a major stopover for people traveling to Karjat. Several films, TV serials, commercial ads have been shot here. One of the popular films was Jodhaa Akbar, in fact the lavish sets of the movie remained intact for a long time. A research centre and nursery, which was abandoned due to lack of funding, has been reopened. The huge expanse of land can produce around 500 different species of medicinal plants, used in Ayurveda. Its located beyond Kashele towards Murbad and is worth a visit if you interested in Ayurveda and medicinal plants. Situated around 1 km away from Kadav in Chote Takve village is the dog breeding farm. Its been around for 10-15 years and has a wide range of pedigree dogs; Caravan Hounds, German Shepherds, Doberman, a couple of Pugs, Cocker Spaniel and a few more. You can imagine the chaos in there, some were aggressive, playful, silent, one had just given birth to puppies. If you are a dog lover then drop by this breeding farm.